So, the thing about depression, at least the way mine works, is that, sometimes, when I get towards the end of a depressive period, I feel like things are going to get better, but that feeling can last for weeks or even months with little actual change in my mood or productivity. Which is sort of where I’m at these days. The good news, of course, is that things aren’t getting worse. The bad news is that no matter how much I feel like things are looking up, there’s no telling how much longer it’s going to be before I actually am better. So, this week, I only managed to write my regular Star Trek: Discovery and Shannara Chronicles coverage, in spite of having intended to write quite a bit more than that. It just didn’t happen, so I’m more than a little disappointed with myself. It didn’t help, either, that I was mired all week long in a book that I just didn’t enjoy, even though I’d been super hyped for it. I kept reading and reading and hoping it would get better, but it did not. It was a bummer. Fortunately, I’ve been reading some better stuff this weekend. I started reading Fonda Lee’s Jade City yesterday, and this morning I raced through Matt Wallace’s upcoming, penultimate Sin du Jour novella, Gluttony Bay, which is fantastic. No one writes action like Matt Wallace. With Halloween coming up on Tuesday, it’s a good time to read something spooky. Lit Reactor has a list of the 20 Best Horror Stories Available Online for Free. At Electric Literature, there’s an indepth look at some of Alvin Schwartz’s Scary Stories to Tell in the Dark. Book Riot lists 7 Monstrous, Feminine and Free Short Stories. At Nerds of a Feather, Chloe N. Clark continued her Horror 101 series with a post about the uncanny. This Skiffy and Fanty discussion on Indigenous Representation in Horror (with Darcie Little Badger, Nathan Adler and Stephen Graham Jones) is a must-listen. The Murders of Molly Southbourne author Tade Thompson was interviewed at Lightspeed. At the Barnes & Noble Sci-Fi and Fantasy Blog, Kameron Hurley answered some questions about her upcoming collection of Nyx short stories, Apocalypse Nyx. Hurley’s Beldame Apocrypha trilogy is still my favorite of her work, so I am stoked. The Learned Fangirl picks apart black representation in Doctor Who‘s modern era. At Winter is Coming, you can read about Brienne of Tarth and the Role of Absent Mothers in Game of Thrones. It’s super sad and frustrating that this is so hard for so many mostly-white writers to understand, but Chuck Wendig explains that not being inclusive is also a political choice. 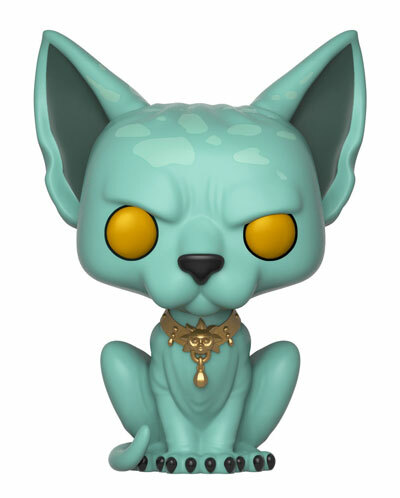 A Lying Cat Pop is definitely on my Christmas list now.